While an increasing number of high-tech companies have been perfecting the art of getting found on the Internet via the use of Inbound Marketing techniques, there are situations where it makes sense to do outbound prospecting via email campaigns, cold calling and appointment setting. The reality is that it takes time for Inbound Marketing to produce leads… while leads may be needed now. This is particularly true for companies that are just starting their Inbound Marketing journey. The time it takes to develop great initial content for their website, that will attract an increasing number of followers, that will develop an ever closer relationship with their company and that will start recognizing that the company’s products can actually solve some of their problems, can be quite a long one. While the groundswell of inbound marketing develops, companies cannot just wait for inbound leads to start coming in and need to engage with their prospective customers on a proactive basis. This is even more true for companies that are getting started altogether, and that are dying to test their value proposition and get early feedback for their new products. The fastest way to get feedback from their target audience is to reach out to them directly, via targeted email campaigns and calls from business development representatives (also called inside sales reps in some companies). 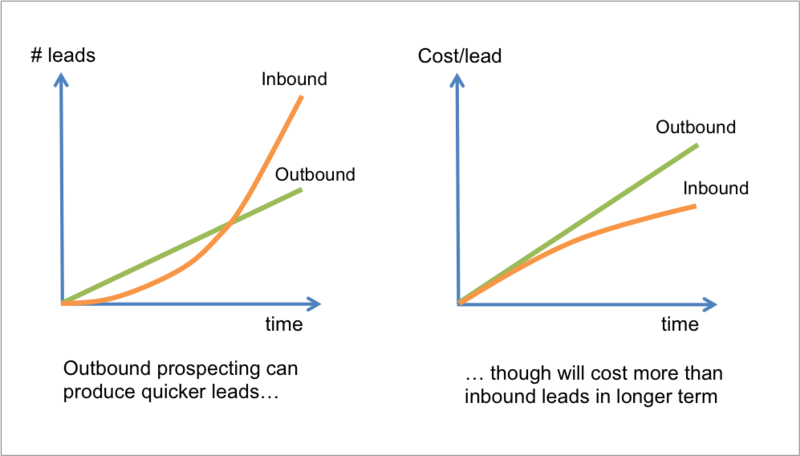 The cost per lead produced via outbound prospecting campaigns is generally higher than inbound leads, as companies have to buy target customer lists, pay the business development representatives for cold calling and appointment setting and eventually technical pre-sales resources for product demos. There are no economic breaks in this outbound process, unlike inbound marketing where online self-service resources such as educational materials, demos, free offerings… allow companies to generate significant economies of scale. But if you need to produce leads fast, outbound prospecting will get you there faster than inbound marketing techniques. You should compare the time it takes a Business Development (BD) rep to get productive (typically 2-4 weeks for first appointments; 2-3 months to full productivity, as in my last company) with the time it will take to get the equivalent number of inbound leads (8-12 months? more? Results vary greatly per company). There may be situations where your target audience may not respond to the Inside Marketing campaigns or when you have a very clear set of targets that you can actually call 1:1. This was the case for one of my recent companies, where we were selling a very expensive product to a C-level audience. Our buyers were CIOs and Line of Business Executives. We were good at engaging and educating the technical users with lots of content but were not getting the attention of our buyers. This was at odds with the success I was experiencing when personally engaging our target buyers. I decided to camp out with the Marketing team until we figured out the way to replicate and multiply that success. I ended up sitting down with one of the BD reps and experimented over the course of a summer until she started getting replies to her emails, answers to her calls and appointments set. Half of the targets that engaged did take the appointment themselves. The other half did refer us to other executives in their organization, which went a long way in securing those meetings. Understanding of their business: review of annual report, website, analyst research notes (we used Google and proprietary investment banking research). Engaging C-levels in Fortune 2000 companies is as hard as it gets and you may not need to go to this extent in terms of your research, especially if you are selling a more commoditized product to an audience of technical users. I would still argue though that some level of research and more personalized approach will get you better hit rates. There are several Marketing Automation solutions out there that can help set up outbound marketing campaigns and measure results, such as Marketo, HubSpot, Eloqua (we used the latter, though we were considering switching in the end as their support got really bad after the acquisition by Oracle). We then measured both ‘elapsed time’ and ‘conversion rates’ for the completion of each step. We monitored the progress over time which gave us good benchmarks for the new hires to hit and allowed us to uncover issues, when metrics started to deviate at a certain step in process. Ultimately, the variable compensation of our BD reps was tied to the number of sales-accepted-leads (number of meetings set). Compare the cost per outbound lead to the selling price of your product: make sure that the cost to acquire a customer (CAC) does not surpass what you will get in terms of proceeds (LTV-lifetime value of a customer), or you’ll find yourself in front of a broken business model. Compare the cost per outbound lead to the cost per inbound lead: as the inbound marketing machine ramps up, compare the quantity, quality and cost of the various type of leads to determine what marketing mix is right for your company. Please share your personal experiences and opinions in the comments section below, so we can learn more about the subject from one another.